This report on mycological poultry was written by Elan Margulies, a formerly mycophagophobic student in PLPA 319. Entering the Mushrooms class I was a mycophagophobe; I was someone who was afraid to eat mushrooms, especially ones that I had collected. Any wild mushroom was too dangerous for me. It was not until I discovered Laetiporus sulphureus— Chicken of the Woods, that I felt comfortable enough to identify a fungus and then eat it. David Arora remarks in Mushrooms Demystified that this is one of the “foolproof four” — an unmistakable mushroom. This large, brightly colored fungus is often found in clusters but is occasionally solitary. You may discover this mushroom during the summer and fall but rarely in winter or spring. The top surface of Chicken of the Woods is bright orange which can be either more reddish or yellowish than you see here. It tends to lighten in color near the edges. This mushroom has no gills, instead its bright yellow undersurface is covered with tiny pores. The young Chicken of the Woods is “succulent” and has a mild flavor. Older specimens tend to change color as they develop, as well as become brittle. The young mushrooms have bright yellows and oranges; in age they dull to yellow and then pure white. Editor’s Aside: Recent mycological detective work has revealed differences in what was once considered to be just one species–there are in fact a handful of distinct species of Laetiporus in North America.2 Tom Volk briefly reviewed them back in 2001, but be aware that many field guides haven’t caught up yet with this improved taxonomy. In our area (northeastern North America), Laetiporus huroniensis is morphologically almost identical to Laetiporus sulphureus — the two can best be distinguished by where they grow and what they grow on. 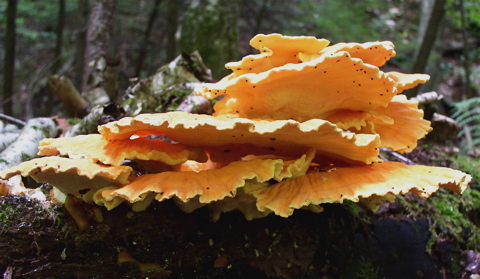 The conifer-loving Laetiporus huroniensis of the Great Lakes seems to cause poisoning more often than true L. sulphureus, and may also sometimes interbreed with the latter, making it even more difficult to distinguish one species from another. In western north America, true Laetiporus sulphureus does not occur, but at least two lookalikes do: Laetiporus gilbertsonii (on eucalyptus, and more frequently implicated in poisonings) and Laetiporus conifericola (on conifers). If you are unlucky, or sensitive to whatever unidentified toxin is in these, you may experience vomiting, chills, and perhaps mild hallucinations–I haven’t heard of any deaths. Yet there are many (probably over 90% of you) who eat these species with impunity, so it’s hard to know what to advise, except caution. Arora, D. (1986) Mushrooms Demystified: A Comprehensive Guide to the Fleshy Fungi, Ten Speed Press, Berkeley. Burdsall, H. H. J., and M. T. Banik. (2001). The genus Laetiporus in North America. Harvard Papers in Botany 6:43-55. Kuo, M. (2005, March). Laetiporus sulphureus: The chicken of the woods. Retrieved from MushroomExpert.Com. Phillips, R. (2006) Laetiporus sulphureus. Retrieved from the rogersmushrooms.com. Volk, T.J. (2001) Laetiporus cincinnatus, the white-pored chicken of the woods. Wells, M., M. Rogers, R. Piekenbrook & D. Piekenbrook (1987). Wild Mushroom Cookery. Portland, OR: The Oregon Mycological Society. Is there some source of documentation for the concern that Laetiporus huroniensis is in some way poisonous? I have searched the internet and my limited library but all I can find are general comments to avoid eating Laetiporus that are found on conifers. I have been harvesting one from what I believe is a huge hemlock stump for the past 3 years and have been happily eating it without incident. The stump no longer has bark and I suppose it might be possible that it is not hemlock but it sits in the middle of a hemlock grove where all of the live trees are big mature hemlock and as dumb as this sounds it looks like a hemlock stump. Hi Salvelinas, I don’t know of any published reports of toxicity. The word on the street is that people are more likely to have a bad experience with the conifer chickens–we were all delighted to discover that the conifer chickens are in fact a different species (L. huroniensis) from the more common ones on hardwoods. I doubt that any specific toxin has been isolated, but if I find out more, I’ll post it here. We tried some of these as well as dreid’s saddle. Not bad, not a great mushroom, though a couple of our freinds cook it by boiling three minutes, then making a gardinere type topping with onions, peppers, and celery. Copied by kind permission of Michael Jordan…. To add a caveat, in 2004 when the current edition of the Encyclopedia of Fungi was launched at a National Trust property, to which 60 journalists were invited for lunch, there was an incident involving this species. On the day before, we had found a specimen of Laetiporus sulphureus in prime condition, on Oak, which was collected and incorporated, lightly sauteed, as part of the meal. Approximately half an hour after ingestion, 6 of the 60 journalists became violently ill – vomiting, cyanosed, sweating, icy cold, with raised pulse, and very frightened. The remaining 54 suffered no ill effects. The doctor who attended diagnosed a severe allergic reaction and the symptoms subsided after about 2 hours. Subsequent investigation turned up research by a US-based toxicology team at the University of Berkeley, California. It had concluded that 10% of the people taking part in extensive trials, suffered these severe effects. Our experience was exactly in line with this figure. It’s also worth bearing in mind that Laetiporus sulphureus growing on Taxus hosts, is potentially lethal. PS – Taxus is the genus of yew shrubs and trees. Interesting, Pete. Can you help us find the mentioned US tox report? Many people–probably more than 50–ate this species last year at the New York Peck Foray and didn’t see any poisonings. In the UK the only species we have is L. sulphureus – there are no others. I have eaten L. sulphureus for years with no problems. Then, a couple of years ago, I became ill after eating it with the same symptoms as described by Michael. I had eaten the same specimen a couple a days before with no issues at all. It had also been cooked in the exact same fashion. Not believing that this illness could have been caused by the mushroom I picked another a few weeks later (in good condition and growing on beech). Again, the first time I cooked it there were no problems. However, the second time I consumed it I was ill again! After this I gave up eating the thing. I have since been told that it’s possible to develop an allergy to L. sulphureus over time. It’s also possible that something in the mushroom builds up in my body, so when I eat it for a second time (soon after the first) I get poisoned. We are edging toward resolving the species complex that is Laetiporus sulphureus. Witness this 2009 paper that suggest it includes at least 11 genetically-defined groups, worldwide. I expect that a little more study and a robust set of analyses will lead us to a much better understanding of world Laetiporus species in the near future. Stay tuned.